It’s meal prep time! I’m sorry I didn’t get this post up on Sunday, but a day late is better than never! 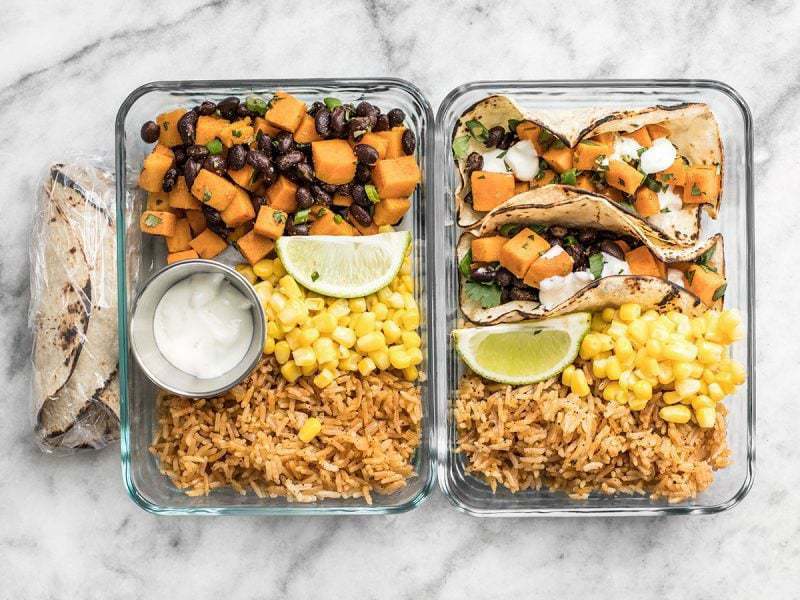 :) This week I remade and old recipe that I love, Sweet Potato Tacos, and built my meal prep around that. I also added some Taco Rice to bulk it out, and some leftover frozen corn that was stashed in the freezer and needed to be used up. 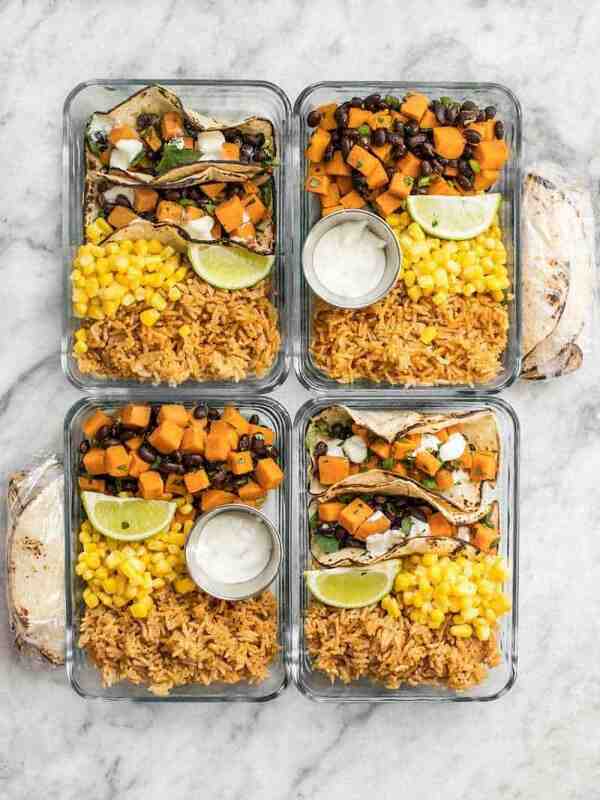 I’ve pictured the Sweet Potato Taco Meal Prep two ways below so you can see it both assembled and how you should actually pack them to maintain the best quality. I used my Taco Rice recipe for this meal prep to keep it vegetarian, but if that’s not a goal you could use Cilantro Lime Rice instead. A little avocado, sliced jalapeño, or even some Pickled Red Onions would also be awesome in this box. Make it your own! I highly suggest leaving the tacos deconstructed for storage and building the tacos after reheating, to prevent the tortillas from getting soggy. 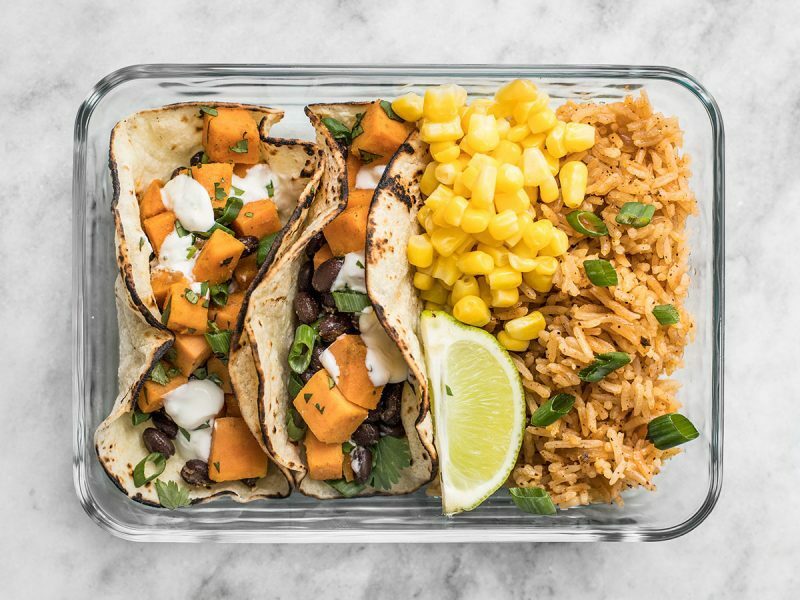 You can reheat the sweet potato/black bean filling, taco rice, and corn all together in the box, leaving the tortillas, lime crema, and lime wedges out of the box while reheating. Hi Beth, let me first say I almost didn’t make this just because I’m not a huge fan of black beans but against my taste pallet I went ahead and made it! When I say I wanted to eat this for Breakfast, Lunch and Dinner I am not kidding!! The Lime Cinema complements the the rest so perfectly! This is definitely a meal I will add to my fav things to cook! Thank you! Hi Beth! Thank you for getting me out of my “I am out of ideas for work lunches” rut! I wanted to ask you, would it be possible to use onion powder or some other substitute in the rice recipe instead of chopped fresh onion? If so, would one have to make other adjustments to the recipe as well? Yep, that should work fine in most recipes! :) It’s hard to say exactly how much, but probably 1/4-1/2 tsp onion powder per onion. Thanks for having so many veggie options in your site! There are excellent meal prep posts here. Wow! What a yummy treat to bring to work. Certainly beats most of my boxed lunches. I have been using the same size Pyrex containers for a decade. Quick question: do the stainless steel cups fit in the Pyrex containers with the lid on? If so, I am going to buy them today! Nope, They’re just a smidge too tall, so I would keep those on the side. I like this idea! A little meatfree Monday option. I love using sweet potatoes with taco flavors. I actually make my own taco stuffed sweet potatoes ( https://www.behindtheplates.com/turkey-tacos-stuffed-sweet-potatoes-recipe/ ) But I want to try your spin on them as well. Thanks for sharing!! Looks delicious! Love your meal prep posts.